Inside view. Note the extended bed on the frame. Large books are a pain to sew. It is often impossible to reach all way to the end when holding the needle, so it is necessary to switch hands mid-way and suspend a floppy half-gathering at the same time. This fixture alleviates the problem by holding the leaves up and out of the way. Some might want something similar for smaller books. It also speeds up two-on sewing, which is occasionally necessary. I made the one above out of binders board, book cloth, and sewing cord. It needs to be large enough to support the leaves, and heavy enough so it doesn’t swing out of the way by itself. Plexiglass might be nice…. 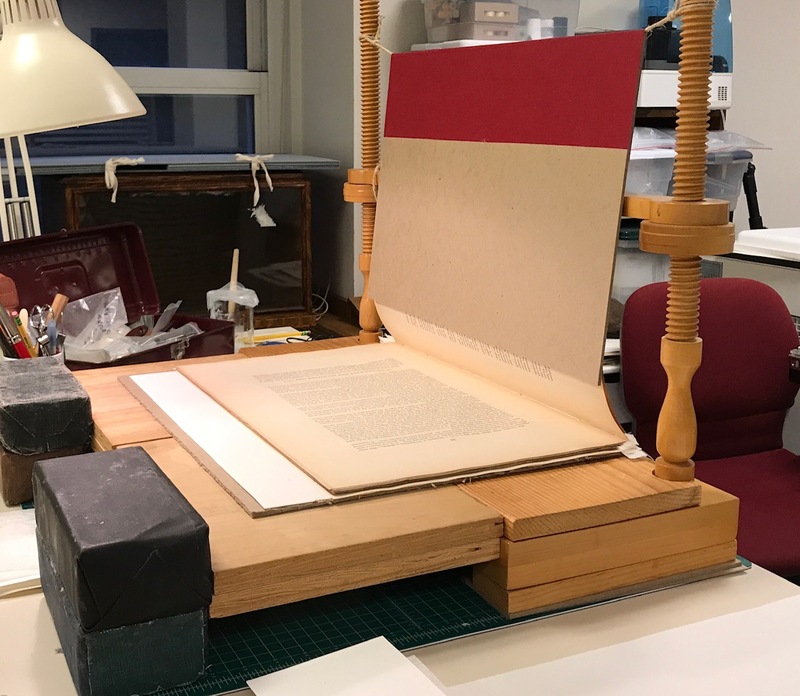 The idea came from Tim Ely’s sewing frame, which has a similar acting wire device to keep the upright part of the page out of the way. 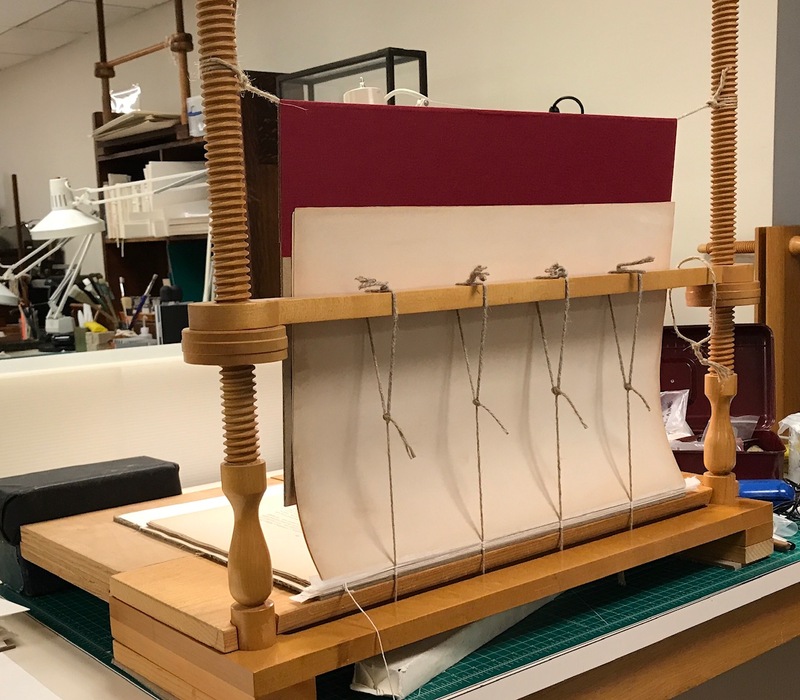 Sewing frames are often quite shallow, so extending the bed, as pictured above, keeps the leaves flat and is a must for accurate sewing. 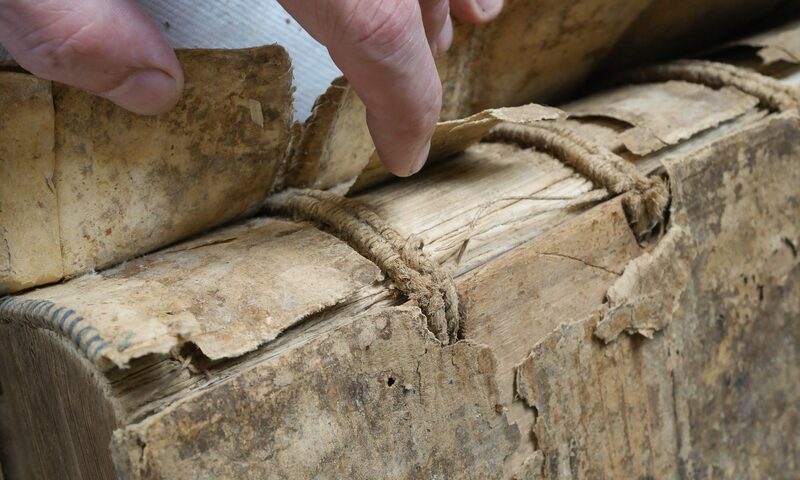 Otherwise there are always weird tensions in the finished binding. A loaded stick also helps to keep the sewing under control and the spine in good shape. The next step is to coin a less prosaic name. A fixture to hold leaves upright on a sewing frame?!?! Yuck! There are already a lot of piercing jigs for sewing, so it needs to be something other than a generic “sewing jig.” The Pageprop?